On Shawn’s 20-winery shortlist (yes, Woodinville has so many amazing tasting rooms that 20 constitutes a “shortlist”) was a winery called Hollywood Hills. Mike and I met in Hollywood, so clearly there was no way we could pass up a winery with that name. Shawn and Matt cheerfully tromped with us through the misty, cloudy cold to the little cottage by the side of the road. Amazingly, we managed to hit Hollywood Hills during a lull. As we came in, a group of people were exiting, and we had the place almost to ourselves for a few minutes, an amazing feat at an event of this size. This is what post-lull looked like. Hollywood Hills seemed like a family-run operation. Everyone staffing the facility were cheerful and friendly, making us feel welcome despite the crowds. In addition, they had created several different tasty noshes designed to pair perfectly with the wines on hand. The meat-eaters in out party declared Hollywood Hills the undisputed winner in the food category for the amazing sausage bites they had, and the vegetarian overindulged in the yummy cheese. After his snack, Matt decided I was ready for my close-up. The staff told us that they were the only winery in the region that created wine from locally grown grapes; unfortunately, they weren’t pouring their Woodinville wine for the event. Mike and I were traumatized. Doom! DOOOOOOOM! Our entire tasting experience would be for nothing! Fortunately, the Hollywood Hills staff rescued us from our despairing state. They smuggled one bottle of their wine produced from locally sourced grapes out of the back room, tucked it into a corner, and slyly served us a unique Woodinville flavor. Thanks, Hollywood Hills — you made our day! 2010 Rattlesnake Hills Viognier: I love viognier. It’s frequently floral, to my palate. This viognier, however, was unique in my experience. It was simultaneously floral and fruity, as if the viognier had hooked up with a chardonnay for one delectable late-night tango. It was like tasting nectarine flowers with a hint of the juicy fruit backing it up. Yum! 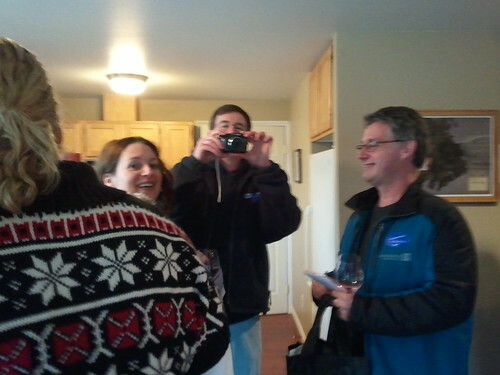 2009 Puget Sound Regent: OMG, a local wine — and a grape we’d never tasted before! This fruit originated in Germany, making it perfect for a cool climate like the Woodinville area. The fruit is grown with no pesticides or spray, but one heck of a lot of flavor. It reminded me a lot of Pinot Noir and a little of Grenache, full of fruit with a nice solid oak backbone. 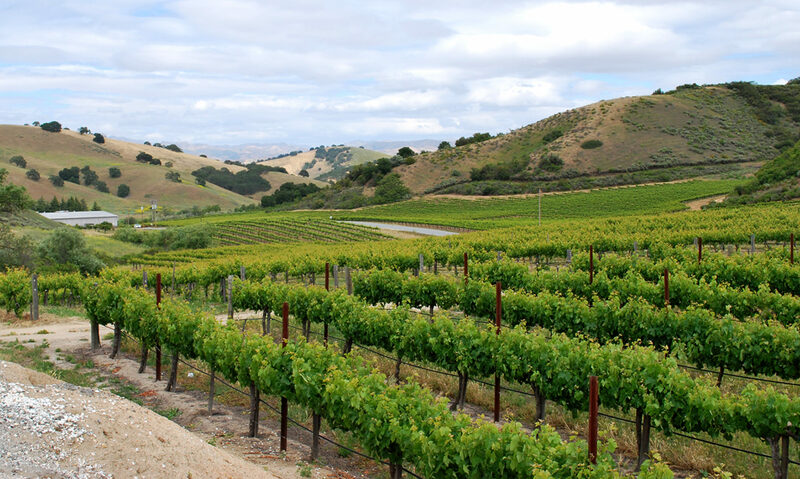 2009 Horse Heaven Hills Grenache: A 100% Grenache? It’s a rarity, but Hollywood Hills makes it work. The smell was spicy and deep, with a taste of deep red fruit and stewed tomatoes. Mike found the tannins to be quite prominent, but expertly handled. He also got some esters and a note of oil paint. 2009 Aperture F-Stop: Aperture is a side label of Hollywood Hills (Aperture — cameras — get it?). This wine blends two different Hollywood Hills Syrahs. I smelled a lot of alcohol; the acid edge of the fruit erupted on my tongue, solidified by the deep tannins. Mike liked it. He thought the tannins framed the flavor and provided some focus, and he commented that the f-stop might open up more with exposure to air (see what he did there?). We agreed after our visit to Lodi earlier this year that visiting wineries during a big event weekend wasn’t an ideal situation for our purposes. In general, during big event weekends wineries aren’t necessarily pouring their best wines, and the tasting staff is just doing their best to get wine tasters out the door rather than create an intimate experience. Plus, there’s normally a huge press at the tasting tables, which drives Mike nutty. However, we’d been talking about visiting Woodinville with our friends Shawn and Matt for a full year. The weekend we planned to visit Seattle was, coincidentally, the same weekend as the gigantic St. Nicholas Festival in Woodinville. We decided to take a chance — and we had a great time. 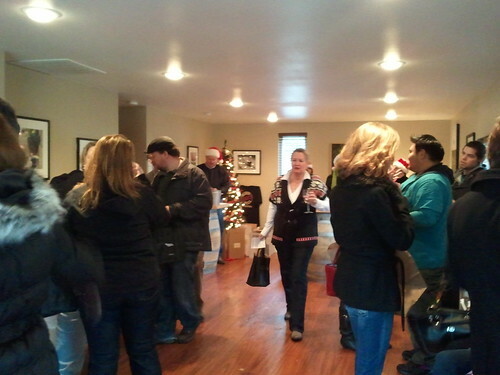 The people staffing the shuttle buses and the tasting room staffs we encountered were upbeat and positive. If anyone was feeling overwhelmed by the crowds, it was not apparent. The other tasters getting on and off the buses and coming and going from the wineries all seemed to be in good spirits (no pun intended – or was it?). One part of the great time, for me, is that Shawn did all the research. She picked up our passes, worked out the logistics and even brought snacks for all of us. 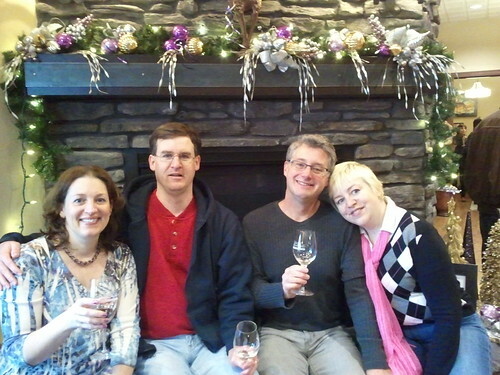 My job was just to get us there; Shawn did the research on the best wineries and pulled together a short-list that combined her favorite Woodinville tasting rooms with several tasting rooms that she’d found had great reviews. From the bus stop, Mike and I had a lovely hike along the Tolt Pipeline Trail and met Matt and Shawn at the shuttle stop. The trail was mostly downhill from where we picked it up. While the views over the fog-shrouded valley were dramatic and beautiful, we were very glad our hike was not a round-trip. Shawn pulled out her shortlist, and we began our excursion. Of course we started at Matthews Cellars; how could we pass up a tasting room named after the Matthew we were traveling with? (I will resist the urge to make an Uncle Travellin’ Matt reference.) 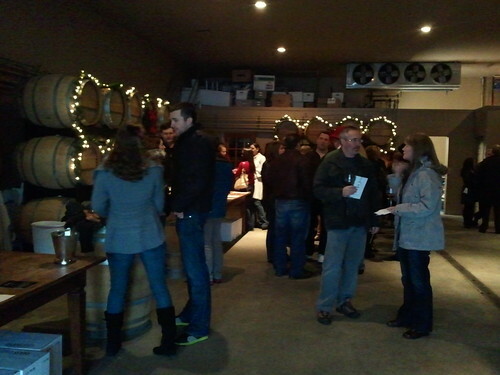 The wine tasting room was decked out with holiday lights. We managed to stake out a table and tasted the white and red they had to sample. There may have been a few hockey checks involved in staking out that table. 2010 Blackboard Sauvignon Blanc (Columbia Valley): Shawn described this as “kinda lemony.” I tasted tart apple, grapefruit and lemon pith. It was very crisp and highly acidic. 2009 Blackboard Red (Columbia Valley): I smelled velvet and sage. It had a nice oak shell with a chewy fruity center, but as we sipped the tannins became more apparent, overwhelming the fruit. Goose Ridge was decked out for the holidays. As would happen with a number of wineries we visited this day, we somehow managed to arrive just as a gigantic crowd of people were leaving, and finished our tasting just as another big crowd was entering. Go us, I say! Matt looks WAY more cheerful in person. 2009 G3 White (Columbia Valley): This had a peachy scent. I tasted pineapple, kiwi, and a little unripe blackberry. (Mike, Matt and Shawn, all natives of blackberry country, looked at me like I was nuts on that last flavor.) It also had a slight buttery mouthfeel. 2008 G3 Red Blend (Columbia Valley): This wine is a blend of Merlot, Cabernet Sauvignon and Syrah. I smelled fruit, but Shawn smelled bitterness. There were heavy tannins surrounding the fruit on this wine, which I think may have led to the bitterness that Shawn smelled. 2007 Merlot: This smelled of truffled cherries and tasted fruity, but with hints of cacao nibs. 2008 Cabernet Sauvignon (Columbia Valley): The aroma reminded me of frosted grapes. The flavor was gentle, with soft tannins warming and mingling with the fruit.